First things first: don’t buy the hype. The concept behind Dr. Horrible’s Sing-Along Blog is not original (it’s an idea recycled from one of Director Joss Whedon’s Buffy episodes) and neither is the story (it’s an almost shameless rip-off of Austin Grossman’s “Soon I Will Be Invincible “). It’s also important to keep in mind that its creators cobbled this together while trying to work around the writers’ strike, that the cast and crew worked gratis, and that Whedon funded it from his own pocket to the tune of more than US$200,000. Sounds like a disaster, right? So why is it so bloomin’ popular, and why haven’t you heard of it until now? I came across this after geek hangouts all over the Internet went ballistic over a surprise guest appearance by Felicia Day, singing “Still Alive” alongside Jonathan Coulton at the Penny Arcade Expo. I had no idea who she was or why she was so popular with the fans (other than that she’s a girl) so I looked her up, and that’s when I came across Horrible. It had an impeccable geek pedigree thanks to Whedon, famous predominantly for his work on the Buffy and Firefly TV series, but it also held great promise because of the incredible kitsch potential of its lead, former Doogie Howser M.D. star, Neil Patrick Harris. He doesn’t disappoint. Harris delivers a pitch perfect Dr. Horrible, with just the right amount of camp to endear us to the character, and his lovelorn alter-ego, Billy. He carries the whole show, delivering a wide-ranging performance that runs the gamut of musical genres from broadway musical to metal/rock. As for the other characters, I thought Captain Hammer (Firefly’s Nathan Fillion) was a bit too over the top, and Day puts in a reasonably sweet turn as Penny, the love interest. The dialogue and lyrics are very clever, but it helps if you know a bit of geek. Characters casually drop phrases like “B.T.W.” which would probably go over your head if you haven’t spent the requisite amount of time on Internet chats or discussion forums. The show is split into three acts, with the first definitely being the strongest of the three especially if like me, you’re not very knowledgeable of the Buffy universe. Apparently the cameos are plenty, with various Buffy writers, and even Buffy herself, Sarah Michelle Gellar, appearing in the final act. It’s pretty short, with each episode clocking in at under 15 minutes, but forty-five minutes is probably about as much of this style as I could tolerate anyway. So while it’s somewhat disappointing when it ends, I still felt satisfied. It was nothing more than the briefest glimpse into the character; any more and it would be too much of a good thing. � It�s a musical. The concept is not �recycled� from Buffy any more than it is from Singing in the Rain or any other filmed musical. � The cast & crew worked on the promise of pay when the video made a profit, not gratis. I believe that they have gotten paid since. � That�s not Sarah Gellar, just some extra who looks like her when she wears silly sunglasses. 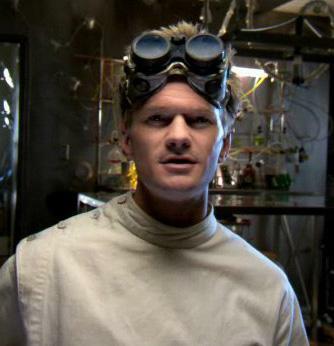 i LOVED dr horrible. i also loved that buffy musical episode, which is actually the only episode of buffy i've ever seen. call me a sucker but i don't even turn the channel now when 'how i met your mother' comes on tv thanks to nph.